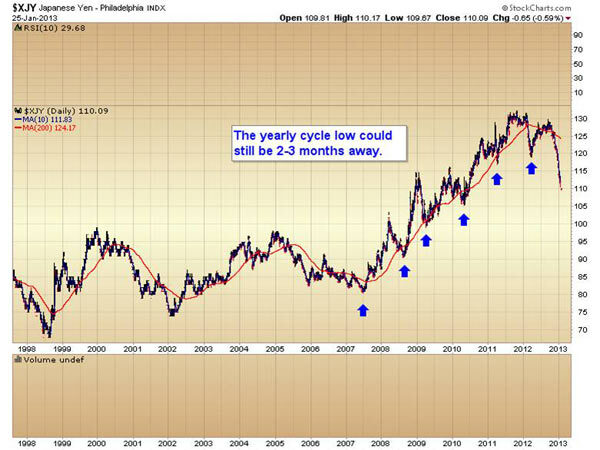 Has The First Currency Crisis Began? As many of you who have read my work in the past know, I expect the eventual endgame to this whole Keynesian monetary experiment that has been going on ever since World War II, to finally terminate in a global currency crisis. I'm starting to wonder if we aren't seeing the first domino start to topple. 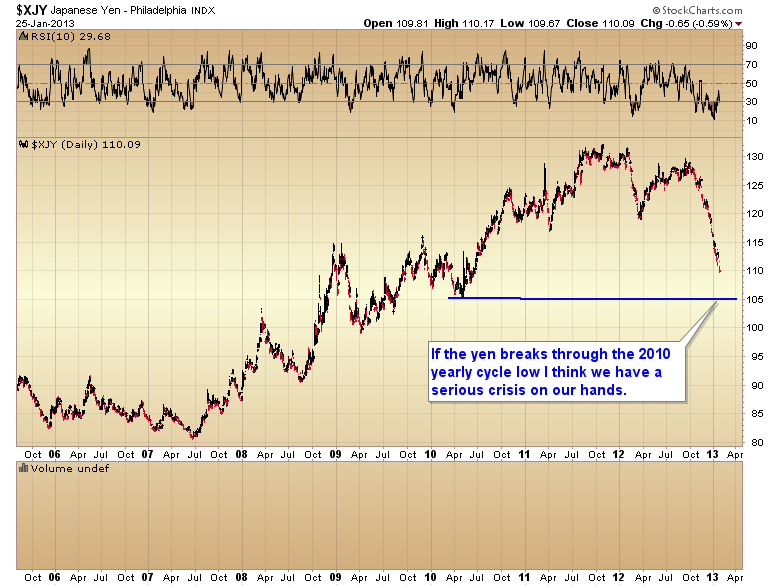 I'm talking about the Japanese Yen of course. I think everyone just naturally assumes that the Yen is dropping in response to Prime Minister Abe's intent to imitate US policy and print its way out of its troubles. 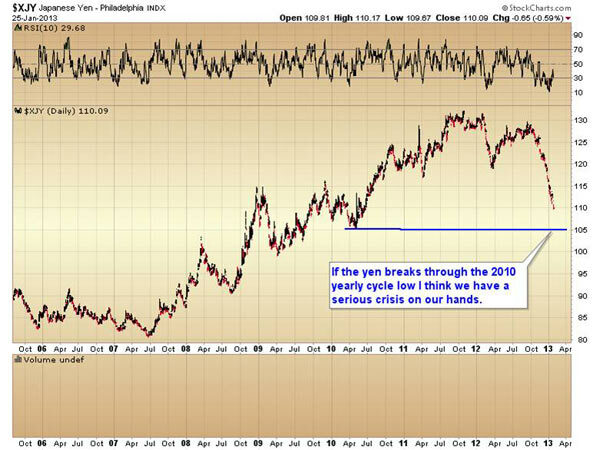 The problem with this strategy is of course, eventually Japan will break its currency. Japan is in a particularly tenuous situation in that their debt to GDP dwarfs most of the rest of the world. The only hope they have of servicing this debt is for interest rates to stay basically at zero. Any move by interest rates above this artificially low level and Japan's debt becomes unserviceable, without resorting to a greater and greater debasement of the currency. Unfortunately that will also result in an acceleration of the collapse of the currency, which would just cause Japanese bonds to be sold even more aggressively -a nasty catch-22 situation. 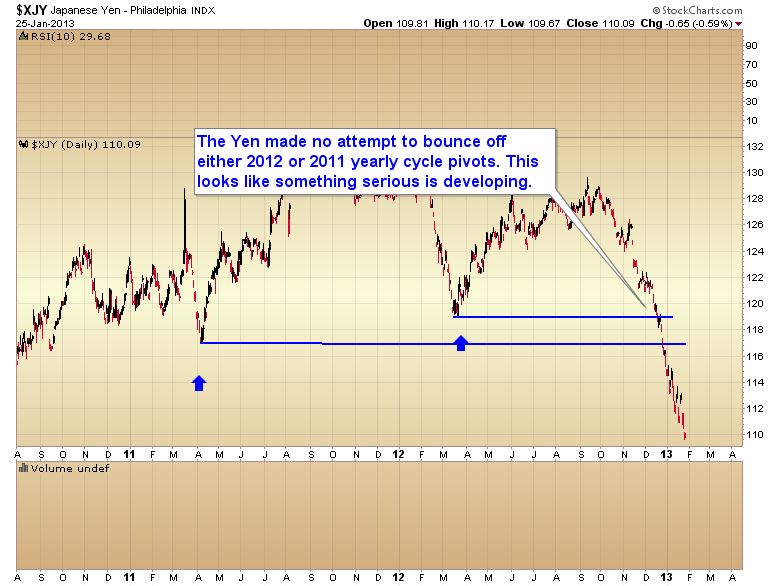 The recent move in the Yen has started me wondering if that end game hasn't now begun. Another warning sign is the fact that this decline cut through not only the 2012 yearly cycle low, but also the 2011 yearly cycle low and never even blinked. In an orderly decline both of these levels should have generated at least a decent bear market rally. In my opinion, it's very worrisome that the Yen didn't even slow down as it moved through these major support levels. Needless to say if the world sees a major currency collapse, which up to this point I think most people would consider to be an absurd idea, it's going to spark a panic for protection. Despite stocks entering the euphoria stage of this bull market, stocks are not going to protect one from a currency crisis. Only hard assets will do that, and the two hard assets that are best at protecting one's wealth are gold and silver. Wouldn't it be fitting that at a time when gold and silver are about to be most cherished, they are now completely loathed by the market?